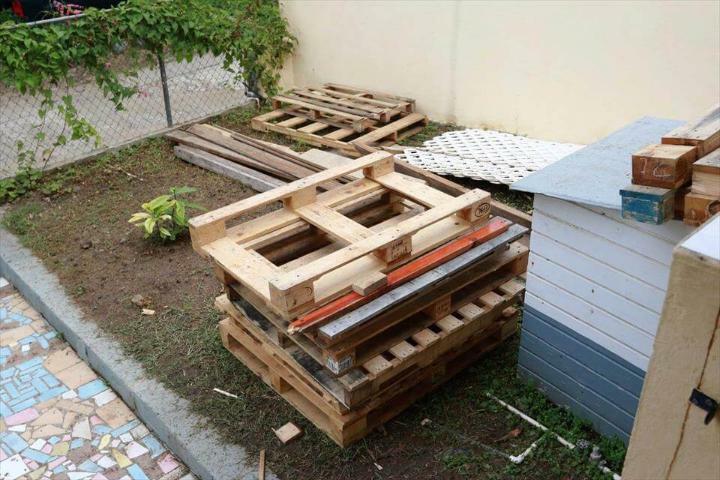 We just recommend you the free pallets for outstanding DIY home improving projects! Really want to style up your patios, home decks and or just willing to install new open terraces? 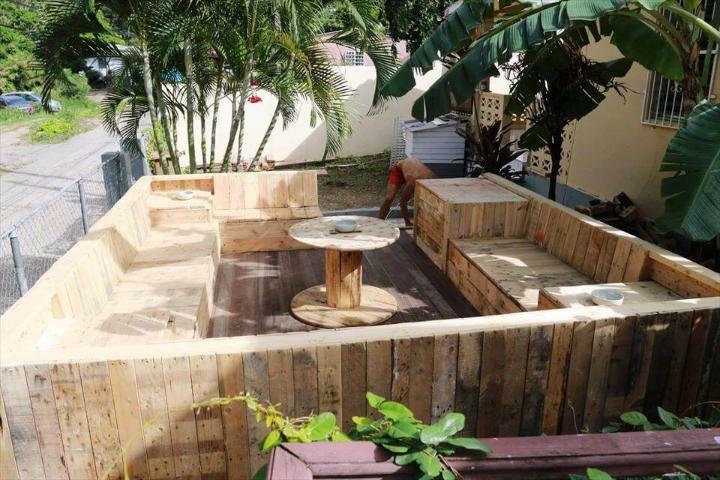 You can go handmade with pallets for all ever low-cost landscaping of your outdoors here you can get yourself inspired of this DIY pallet terrace project, a beautiful wooden terrace with custom-built sitting plans, all has been done with pallets! First you can decide a home outdoor area you need to fancy up or to organize for part time sitting affairs! 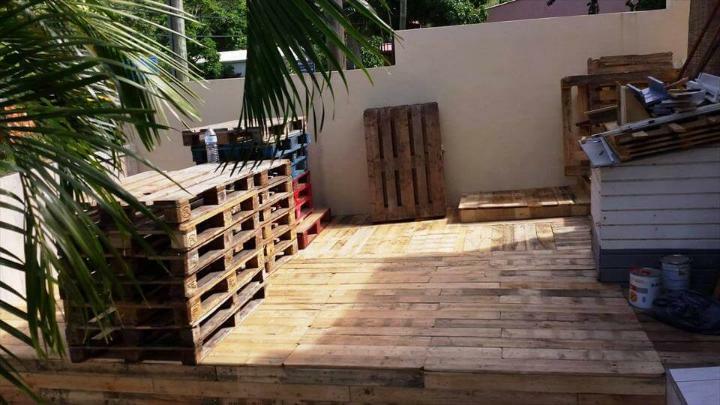 Then you can just grab the skids of pallets and can arrange them simply to install the custom wooden floor just like done in this pallet terrace project but here the base floor has been elevated a little! Finally the solid fence walls have been installed around the pallet-made raised floor which comes also with the attached sitting plans! 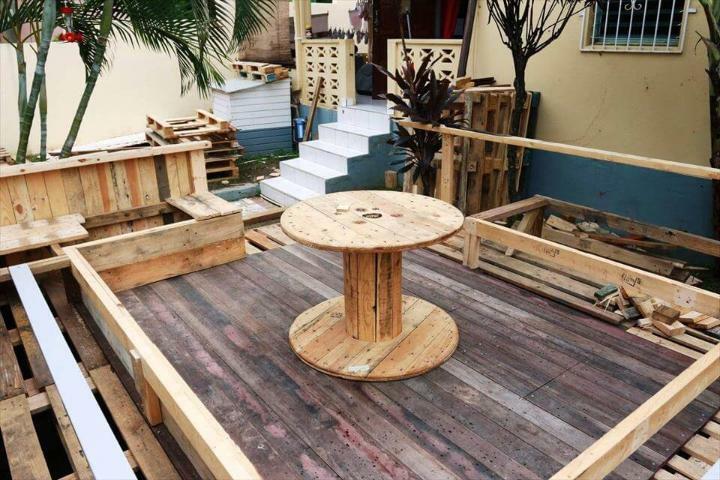 Finally an empty spool has been put right in the center of the terrace as a coffee table! The Yves Perriault has really done fantastic job, her efforts are really praiseworthy, this entire project has been by him!!! 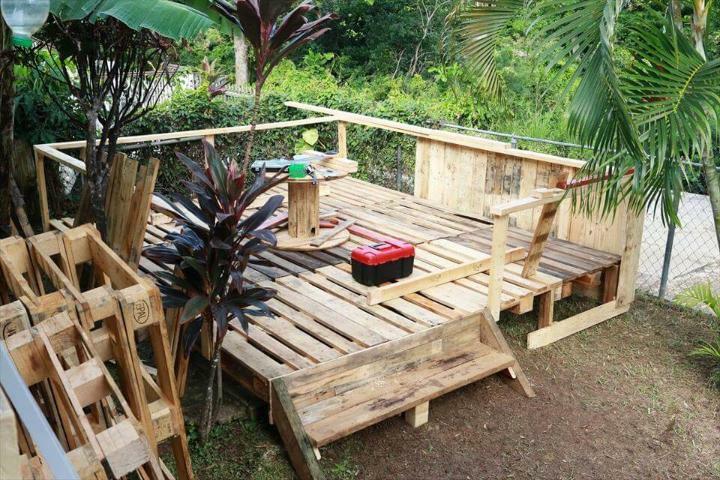 This is the outdoor area of the house decided to install a wooden terrace using some free pallets! You can take some steps to clean and level up this area before getting into construction! 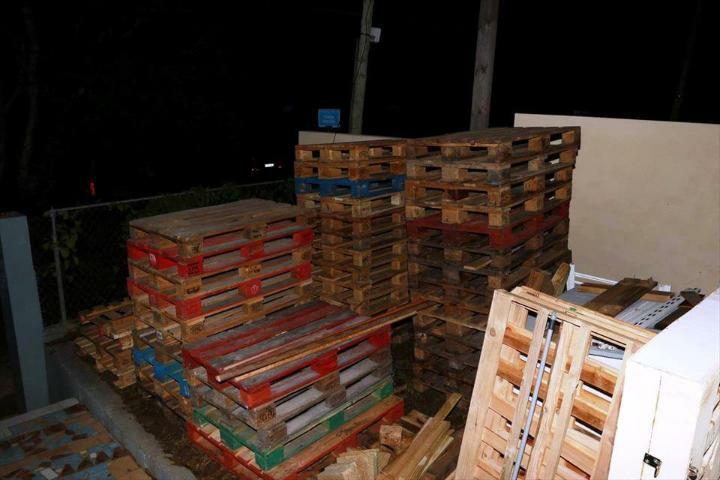 Here first of all a raised wooden platform has been decided to install, skids of pallets have been put together and raised to wooden supports fixed in the ground to do so! 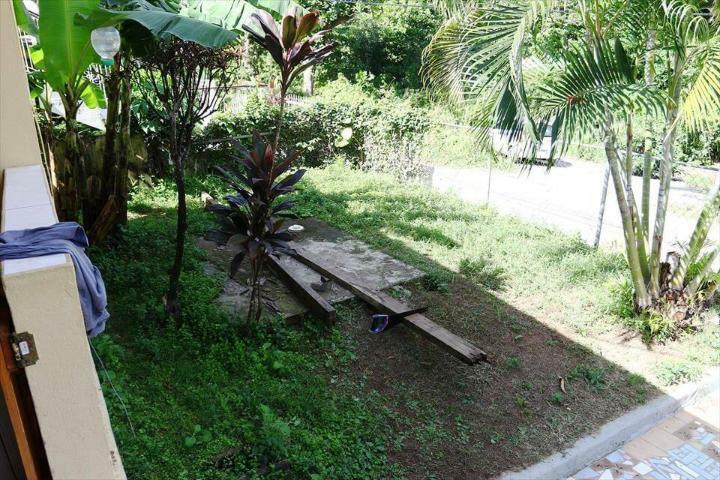 Along with the wooden supports, concrete blocks or tiles can also been used to raise the wooden floor up! 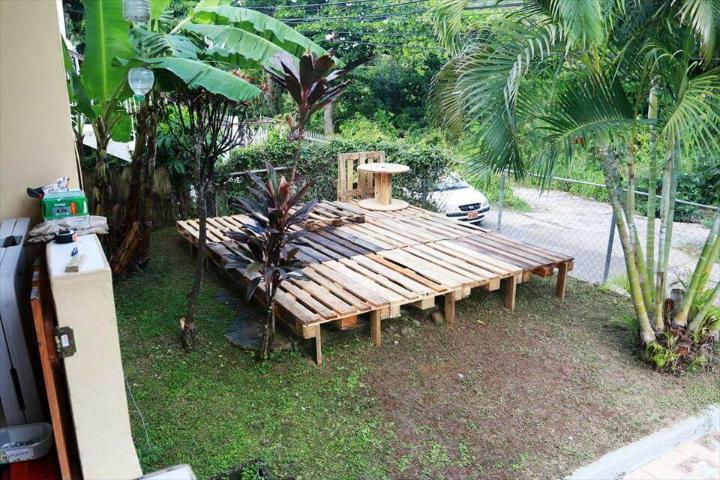 One can also stack pallets up to multiple layers to gain a raised wooden platform for the terrace! 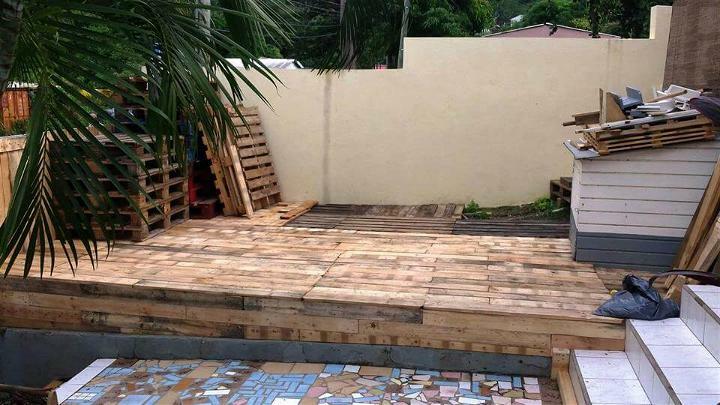 Finally you can load modified and dismantled pallets to install the steps and also the solid wooden fence wall around the raised wooden platform! Here a big creative trick has been played! Custom lattice frame have been installed using straight wooden beams for both fence walls and inside sitting plans, you can see it here! Finally, you can start filing the frame for solid fence walls and also for precious inside seats! 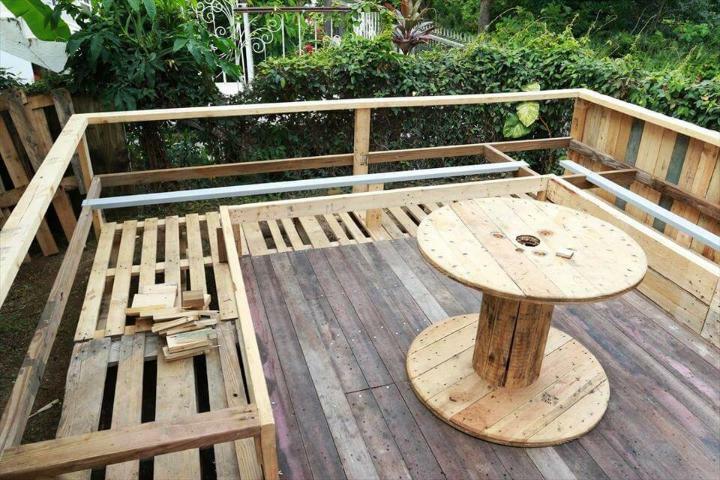 Here is how you can use extra wooden slats to fill solid the frame for precious sitting plan for the terrace! Decide an empty spool for a central coffee table there! The inside seats also comes built-in boxes in the corners which can be filled with potting soil to grow your favorite garden flowers or you can just add lids to these boxes for amazing corner tables to place your beverage cups and other conveniences! 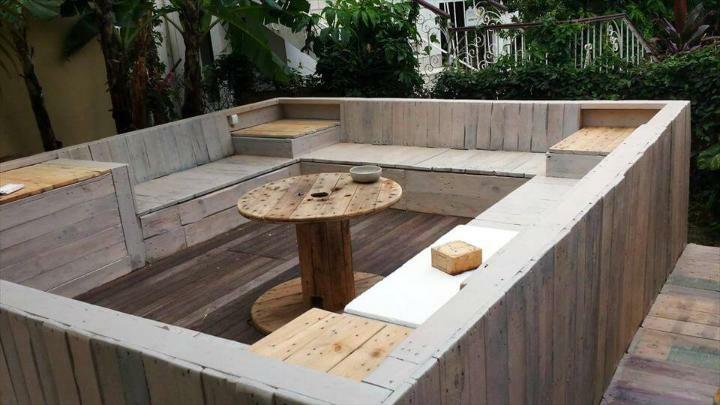 Do add a layer of pallet slats inside for sublime backrest positions of inside attached terrace seats! Extra rustic wooden slats have been planned for an accent wooden overlay floor among the seats! 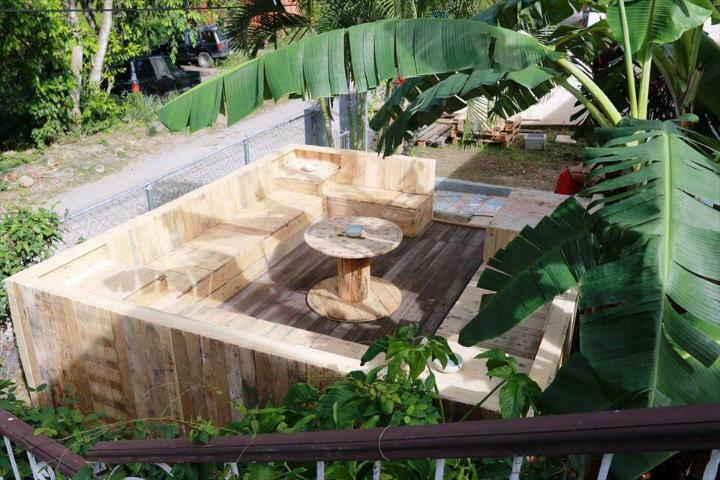 Now you can simply garnish this hand-built pallet wood terrace using your own custom accents and decors! 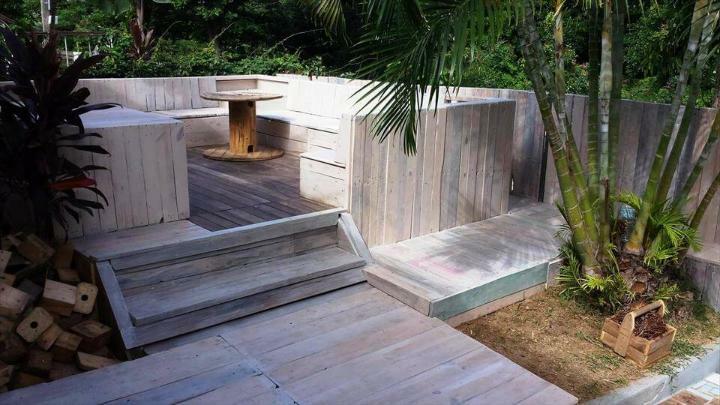 You can also paint the entire wooden terrace for a colorful visual! Add solar lights to corner sides for amazing lighting at night and don’t forget to make the seats cushioned! 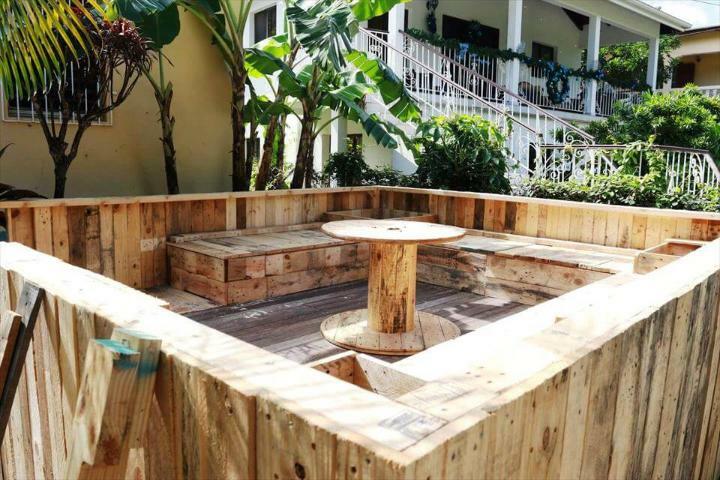 In the same way you can decided pallets for building outstanding decks, backyard party sofa sets and also to install the amazing garden gazebo furniture! 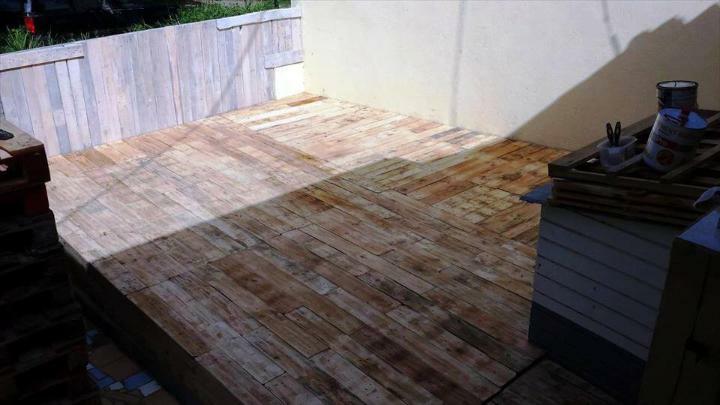 In the part 2 the Yves Perriault has also done a great job, a precious wooden deck has been installed by consuming the rest of pallet supply! 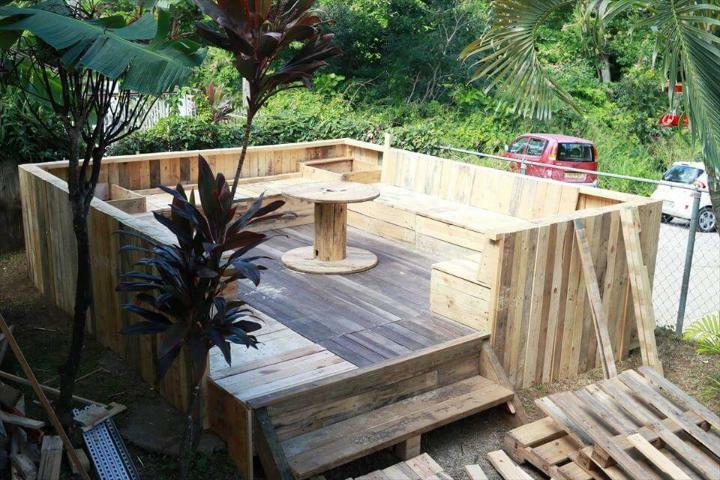 This self-installed wooden deck can also be organized with some lovely sofas to enjoy sitting in pure natural weathers! 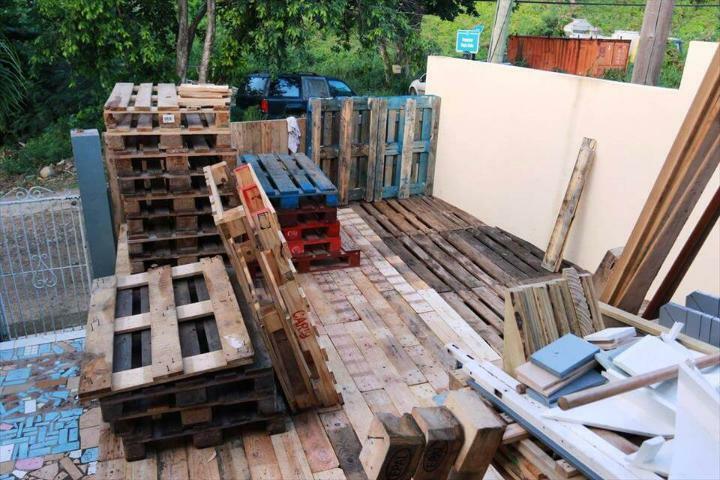 Stock of pallets got to do amazing home improvements! 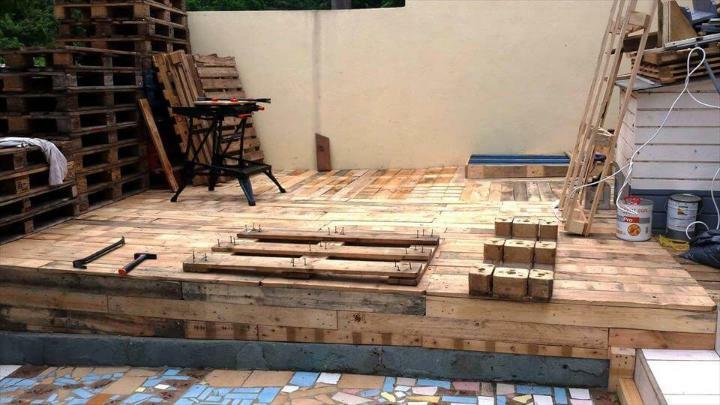 Drag the stock of pallets to place where you need to install a raised wooden deck! 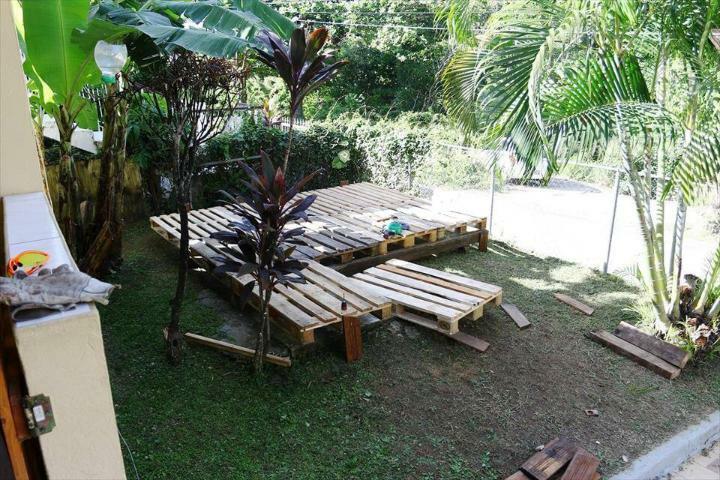 Floor up pallets, after you finish the filling the space with pallets, add the 2nd layer and so on until you get the perfect height for the deck floor! 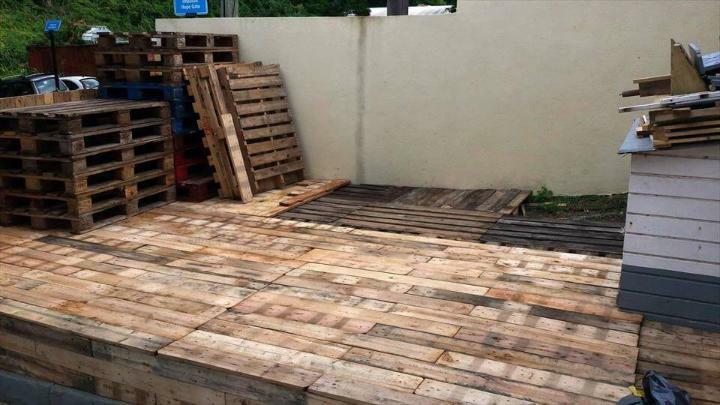 After layering up rough pallets, dismantle the best looking pallets and use the separated lengths to install accent wooden overlay floor! Keep on covering the stacked pallets until you get a solid wooden look of the desk! Fill solid also the sides and corners of the stacked pallets! Prefer different styles of filling of pallet slats if you need to create some beautiful patterns! 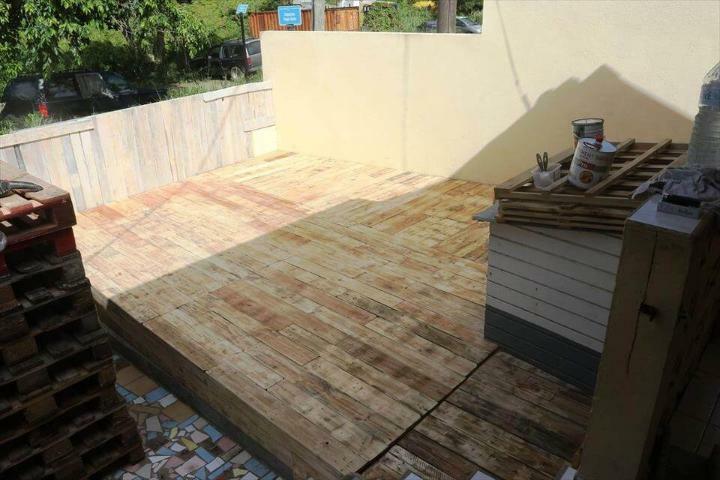 Remove the spare wood and just plan a finish for your finally finished deck! 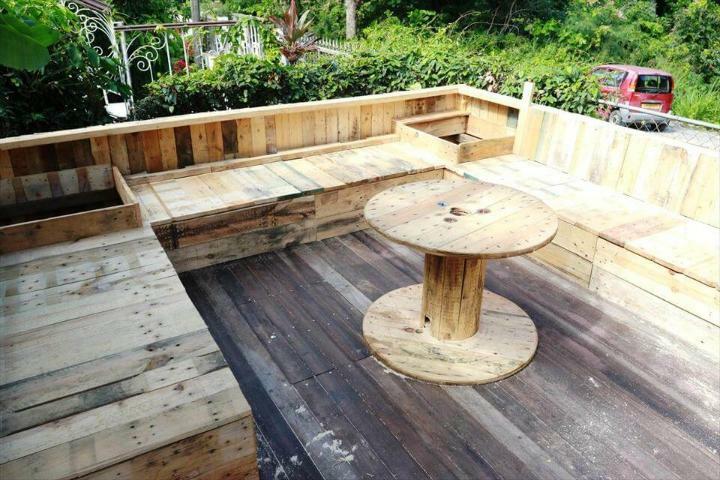 Left it unfinished for a beautiful rustic wood look, this wooden deck will be a great spot for guest entertainments! 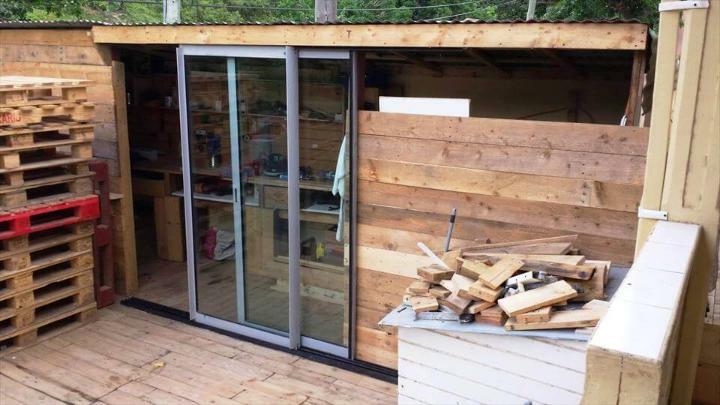 Get pallets for every of your indoor or outdoor improvement plants, grab pallets also to install new wooden cabins, sheds and houses, a cool on has been shown here! 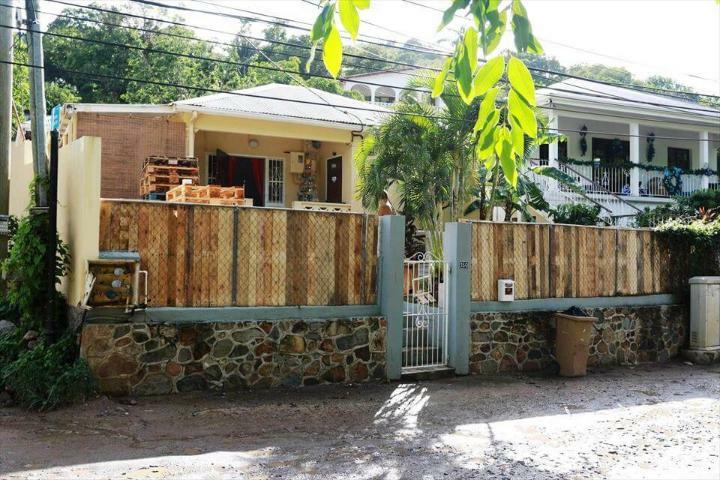 Here pallets have been also been preferred to install beautiful wooden fence wall, here slats of pallets have been used to cover the already made metal lattice fence walls! Fancy up both the pallet-made terrace and deck with custom paint coats, one can also prefer white wash or chalk paint coats! 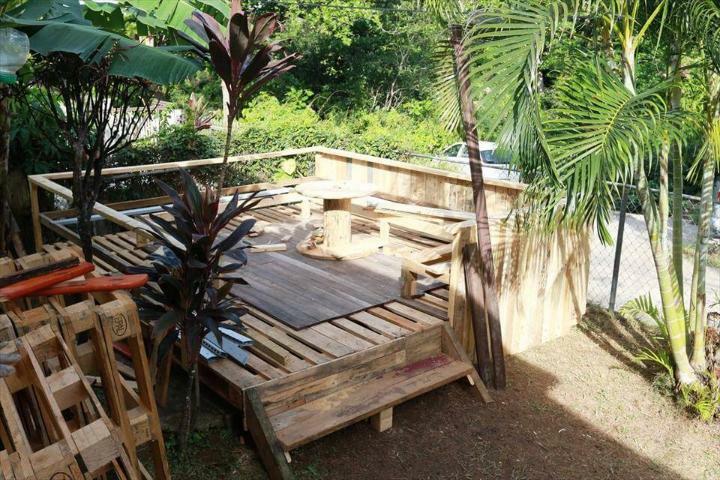 A perfect wooden deck and an amazing wooden terrace ever made with pallets, just comfy up the seats using mattresses and pillows and have a great with your family there!